My name is Greg German. I am an AMGA Certified Rock Instructor and Single Pitch Instructor. Good question. My wife tells me I have an odd sense of humor. 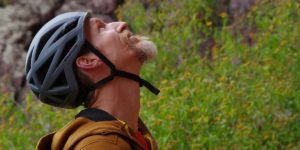 I learned to climb in Eldorado Canyon State Park, and ‘Eldo’ is my favorite climbing destination. It also has a reputation for a unique and funky style of climbing. The term ‘Eldo Prancer’ is thrown around on the climbing blogs (MountainProject, Supertopo, etc) as a demeaning reference to Eldo climbers. The meaning is vague, but the gist is that the strange misfits that frequent Eldo are somehow less manly than climbers elsewhere. (I think that some folks are just jealous of what a great place Eldo is.) I’m not the quintessential ‘Eldo Prancer’, but I’ll wear the label for a laugh. It’s a name you’ll remember. q:What sort of climbing experience do I have? I learned to climb after I joined the CMC (Colorado Mountain Club ) in 2001. I discovered that my 6’9″ wingspan gave me a natural advantage. I fell in love with the sport. From 2006 to 2010 I was the co-director, then director of the CMC’s Trad Lead Climbing School. I designed a curriculum where students learn to build anchors and place lead climbing protection on multi-pitch routes. I find teaching beginners to be very rewarding, and I’ve been told that I am a very positive, encouraging, and patient man. In 2008 I became an AMGA Certified Single Pitch Instructor, and in 2012 I became a Certified Rock Instructor. I enjoy most types of technical rock climbing: trad, sport, aid, bouldering. I’ve done a few big wall climbs in Zion and Yosemite. I spend a lot of time now replacing rusty old climbing anchors. Occupation(s): Luthier*, Guide – *visit GermanGuitars.com to find out more.